(Phys.org)—Researchers have designed a thermal regulation textile that has a 55% greater cooling effect than cotton, which translates to cooler skin temperatures when wearing clothes made of the new fabric. The material can be fabricated using 3D printing and could provide a simple, low-cost way to cool the human body and reduce the need for air conditioning on hot days. The researchers, led by Liangbing Hu at the University of Maryland, have published a paper on the new thermal regulation textile in a recent issue of ACS Nano. "This is the first time that a highly thermally conductive textile is 3D-printed with excellent mechanical strength and greatly enhanced thermal conductivity, which can cool the body significantly, especially for office settings for energy savings," Hu told Phys.org. The new textile is made of a nanofiber composite consisting of boron nitride and poly(vinyl alcohol), or PVA. Using 3D printing, the researchers fabricated nanofibers that are highly aligned, uniform, and densely packed together, and demonstrated that a fabric woven from these nanofibers exhibits a strong cooling effect as well as good mechanical strength. A key property of the next textile is its high thermal conductivity, which allows body heat to pass through the fabric by conduction to the ambient environment. In contrast, most conventional textile fibers such as cotton typically have a lower thermal conductivity, which traps more of a person's body heat inside their clothing. 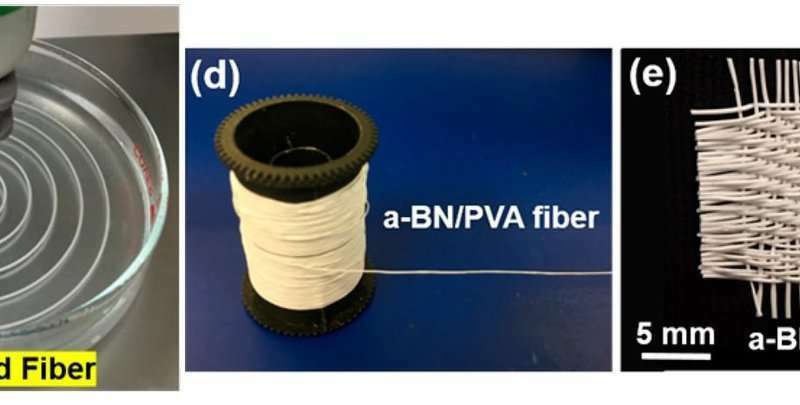 In simulations, the researchers showed that fabric made of the new nanofibers has a thermal conductivity that is more than twice as high as cotton fabrics, and more than 1.5 times higher than PVA fabric without boron nitride nanofibers. Several other types of thermal regulation textiles have recently been developed for maintaining a cool "microclimate" near the human body. For instance, moisture-wicking fabrics cool the body by removing excess moisture, but primarily work only in highly humid (or sweaty) circumstances. Some technologies use cold packs and others consume large amounts of energy. 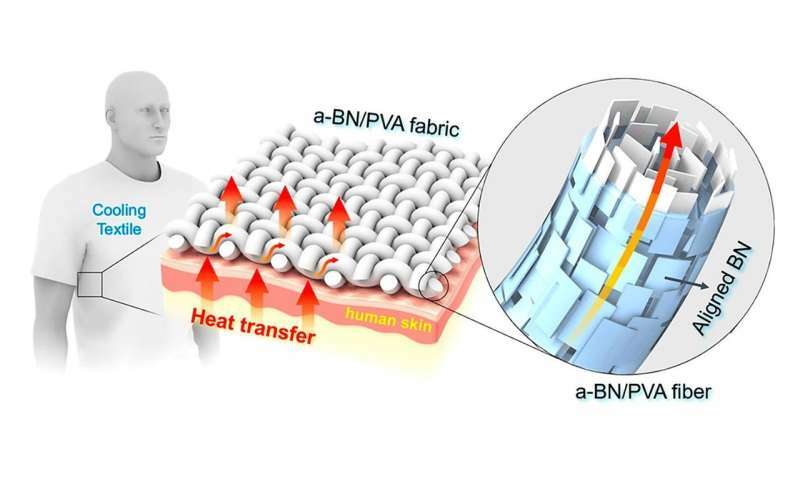 The researchers in the new study expect that the simple, low-cost nanofiber textile demonstrated here may offer one of the most practical solutions for keeping cool in hot weather. In the future, the researchers plan to work toward realizing these applications. "We are carrying out more research to further improve the performance through materials design and also working on scalable demonstrations using 3D printing," Hu said.